Dubai, United Arab Emirates, 19 April 2018 - The new Jaguar XE 300 SPORT has made its debut by setting a unique lap record. The special edition sports saloon became the first car to complete a flying lap of the world’s longest artificial outdoor ice circuit, at Flevonice in the Netherlands - but it had to beat a Winter Olympic gold medallist skater to set the fastest time. 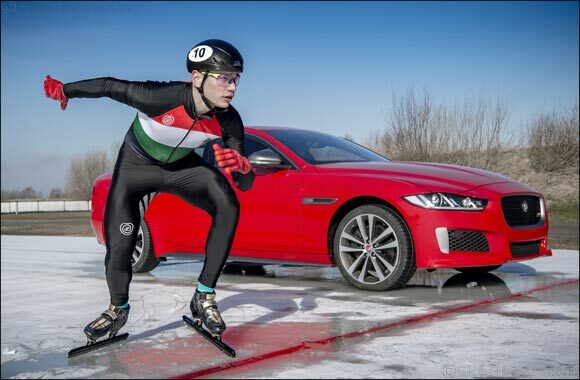 To give the icy time trial an extra edge, Shaolin’s girlfriend – Team GB skater Elise Christie – was part of team Jaguar. With Elise in the passenger seat, the XE 300 SPORT took full advantage of Jaguar’s sophisticated traction technologies to maintain its composure. Jaguar Stability Development Leader Sean Haughey lapped the track in 3 minutes 3 seconds at an average speed of 59km/h (36mph). Staying true to Jaguar’s sports car DNA, the new 300 SPORT is equipped with the advanced 300PS 2.0-litre Ingenium petrol engine, which powers the XE from 0-100km/h in 5.7 seconds (0-60mph in 5.4 seconds). With 400Nm of torque, its effortless acceleration around the 3km ice circuit was too much for the Olympic Champion. The new 300 SPORT joins the XE line-up and is available on the XF featuring unique exterior and interior design elements. Special design accents continue inside with yellow contrast stitching on the steering wheel, seats, door casings and armrest. Other modifications include 300 SPORT branded treadplates (with an illumination option in the XF), sport carpet mats, badged steering wheel and embossed headrests. The XE and XF enable customers to be more connected, with Jaguar’s advanced Touch Pro 10-inch touchscreen infotainment system as standard. Further design enhancements as standard across all three models include metal treadplates with Jaguar script (illuminated on XF derivatives), chrome side window surround, chrome seat switches for all electric seats, premium carpet mats, bright metal pedals and frameless auto-dimming Infinity Mirror.